12 Commonwealth is located on the south side of Commonwealth, between Arlington and Berkeley, with 2 Commonwealth to the east and 16 Commonwealth to the west. 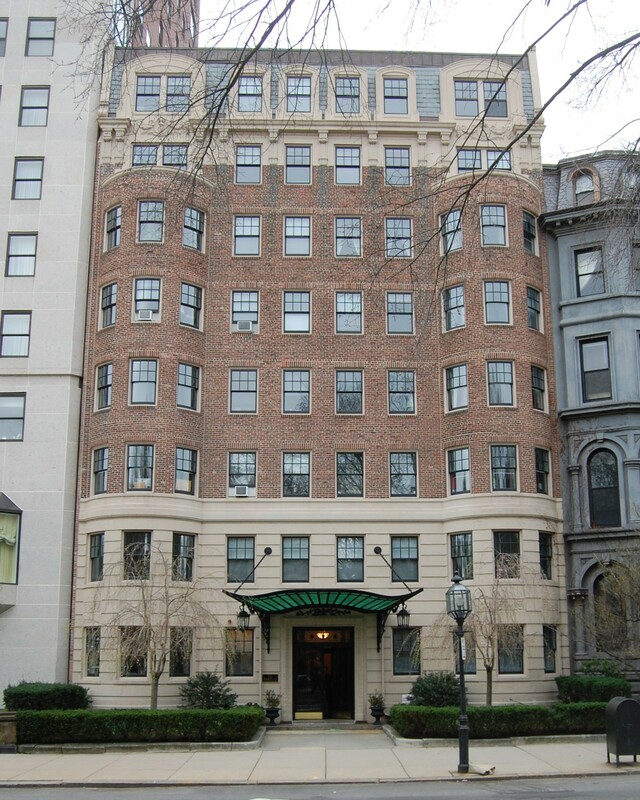 12 Commonwealth was designed by architect George Nelson Jacobs and built in 1927, an eight story apartment building called The Barclay. The Barclay replaced two townhouses at 12 and 14 Commonwealth that were purchased in 1925 by Jacob Marks, president of the M & S Petticoat Company. He and his wife, Eva (Finer) Marks, lived at 106 Queensberry. Click here for an index to the deeds for 12 Commonwealth. Jacob Marks appears to have developed 12 Commonwealth in association with real estate dealer Louis Samuel Koufman, who is shown as the owner on the original building permit application for the new building, dated August 5, 1927, on the applications to demolish the two townhouses, dated October 3. 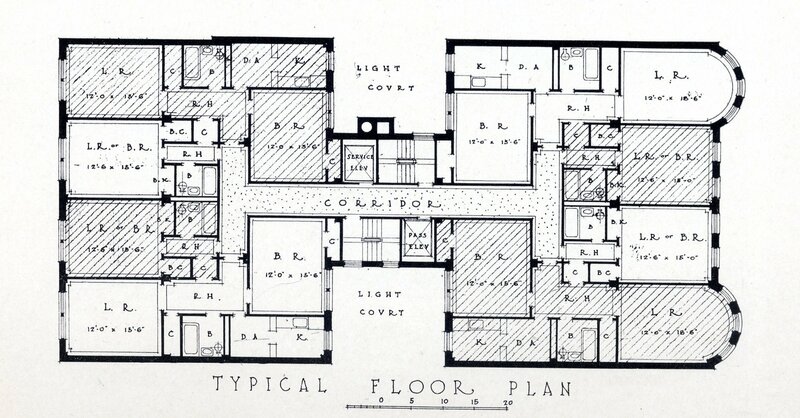 1927, and on the architectural plans for for the building. 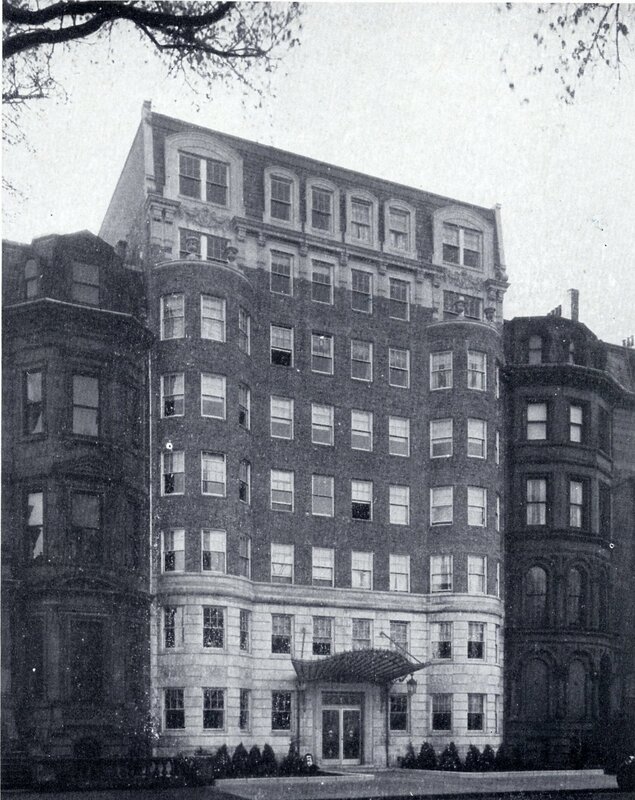 In 1925, Jacob Marks and Louis Koufman has similarly collaborated on an apartment building at 180 Commonwealth, also designed by George Nelson Jacobs. 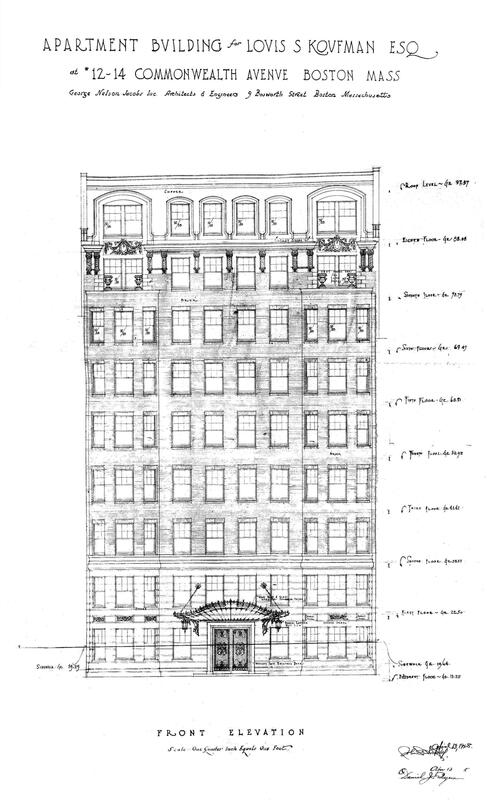 In the August 10, 1927, zoning Board of Appeal decision approving the proposed egress for the building, it is described as “an 8-story apartment house of first-class construction containing four suites on each floor … with two enclosed stairways and two elevators…”. The blueprints for the building show four suites on the second through eighth floors, and doctors’ offices on the ground floor. The original permit application indicates the number of units as “32 or 60 Combination,” and subsequent permits have shown the occupancy as sixty units. Plans for the building — including foundation and column plans, elevations, floor plans, and floor framing plans — are including in the City of Boston Blueprints Collection in the Boston Public Library’s Arts Department (reference BIN B-2). On December 19, 1928, Jacob Marks entered into a mortgage with Louis Koufman, who assigned it in 1929 to the First National Bank of Boston. In February of 1931, Jacob Marks declared bankruptcy, and in March of 1932 the mortgage was foreclosed by Henry B. Hosmer, to whom the bank had assigned it. The property was sold at auction on March 28, 1932, to real estate dealer William J. Stober, who sold it on February 16, 1937, to the Standard Commonwealth Corporation. On August 5, 1943, 12 Commonwealth was acquired by Max Sandler, who sold it the same day to hotel operators Abraham M. Sonnabend and Leopold M. Sonnabend, as trustees of A. M. Sonnabend Properties. On November 1, 1943, 12 Commonwealth was acquired from the Sonnabends by Celia (Gorin) Leeder, the wife of real estate dealer Frank Leeder, and Adelaide (Ober) Friedman, the wife of wholesale shoe merchant Simon Friedman. Frank Leeder was a real estate dealer and property manager in partnership with his brother-in-law, Harry N. Gorin. Simon Friedman died in June of 1956. On June 24, 1957. Celia Leeder transferred her one-half interest in 12 Commonwealth to Frank Gorin and Harry Gorin. Celia Leeder died in November of 1957. Adelaide Friedman subsequently married Frank Leeder. On July 1, 1965, she transferred one-sixth interest in 12 Commonwealth to Frank Leeder and one-sixth interest to Harry Gorin, and on August 24, 1966, she transferred her remaining one-sixth interest to Harry Gorin. Frank Leeder died in June of 1969 and Harry Gorin died in July of 1975. On March 10, 1989, the heirs of Frank Leeder and Harry Gorin transferred 12 Commonwealth to Rosalind E. Gorin, Elliot M. Surkin, Earle Leeder, and Laurel E. Friedman, trustee, 12 Commonwealth Avenue Nominee Trust. On September 29, 2017, 12 Commonwealth was acquired from Michael J. and Nancy B. Gardiner, successor trustees of the 12 Commonwealth Avenue Nominee Trust, by the 5438 – 12-14 Commonwealth Avenue Boston MA LLC. The Barclay remained an apartment house in 2017. 12 Commonwealth was built ca. 1870 as the home of dry goods merchant and railroad investor Samuel Henry Gookin and his wife, Frances Elizabeth (Sistare) Gookin. They previously had lived at 140 Boylston and, before that, at 46 Commonwealth. Bainbridge Bunting’s Houses of Boston’s Back Bay does not attribute 12 Commonwealth to a specific architect. However, in his Building Victorian Boston: The Architecture of Gridley J. F. Bryant, Roger Reed indicates that it was designed by Bryant and Rogers, citing an August 27, 1870, Boston Transcript article as his source (that article states that Bryant and Rogers “are the architects of the elegant three story mansion to be owned by Mr. Samuel H. Gookin on Commonwealth avenue”). Samuel Gookin purchased the land on which 12 Commonwealth was built on May 28, 1870, from James T. Eldredge, who had purchased it from Edward W. Saunders on December 9, 1865. Edward Saunders had purchased the land from the Commonwealth of Massachusetts on May 2, 1860. Click here for an index to the deeds for 12 Commonwealth (Demolished). The Gookins continued to live at 12 Commonwealth in 1873, but had moved to 224 Beacon by 1874. On November 15, 1873, 12 Commonwealth was purchased from Samuel Gookin by Francis Page Cutting of San Francisco. He and his wife, Frances Isabella (Frost) Cutting made it their Boston home. Francis Cutting owned a canning business in California and is credited with being the first large industrial fruit and vegetable canner in the state, the first packer to use tin containers, and the first to export California produce to the east. On January 1, 1876, Francis Cutting transferred the property to Freeborn F. Raymond, II, a lawyer, who then transferred it back on the same day to Francis Cutting and his wife, F. Isabella Cutting. It appears that they may have separated at about this time; Francis Cutting returned to San Francisco and Frances Isabella Cutting moved elsewhere (by the 1887-1888 winter season, she was living at The Vendôme; the Cuttings divorced in 1896). By the 1877-1878 winter season, 12 Commonwealth was the home of Henry Hobart. He continued to live there during the 1878-1879 season, but moved thereafter. In 1879, 12 Commonwealth was briefly the home of Susan Burley (Howes) Cabot, the widow of Salem merchant and banker Joseph Sebastian Cabot. 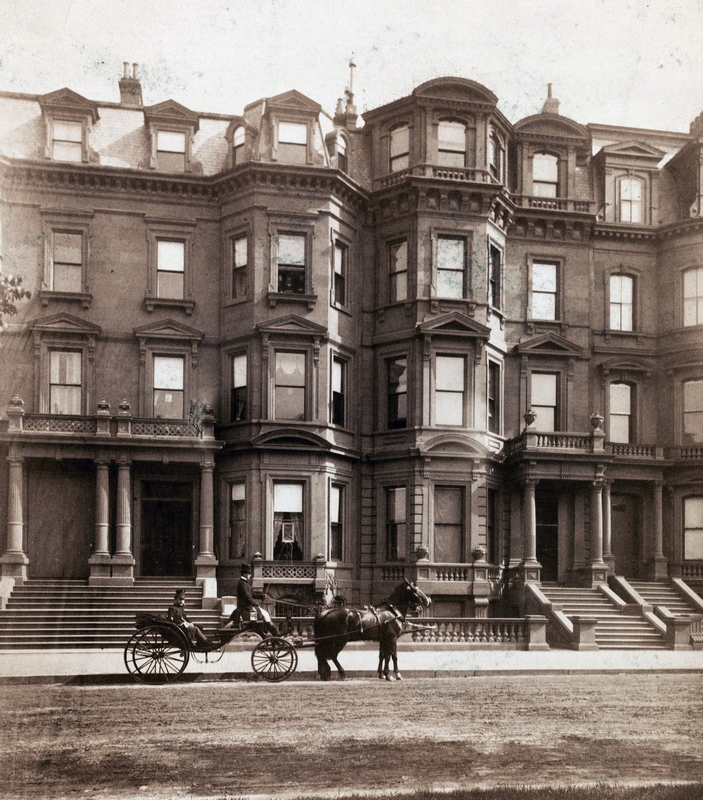 She had lived at 222 Beacon during the 1878-1879 winter season, and by the 1879-1880 season was living at 34 Beacon. 12 Commonwealth was not listed in the 1880-1882 Blue Books. On October 9, 1883, 12 Commonwealth was purchased from the Cuttings by Thomas Allen, Jr., a widower. He previously had lived at 44 Boylston. Thomas Allen was an artist and maintained his studio as well as his home at 12 Commonwealth. He chaired the faculty of the Boston Museum School of Drawing and Painting, and also served as President of the Boston Museum of Fine Arts and as Chairman of the Boston Art Commission. Sometime after acquiring 12 Commonwealth, he remodeled the upper floors, probably to provide a larger space and greater light for his studio. In October of 1884, Thomas Allen remarried to Alice Ranney. The Allens continued to live at 12 Commonwealth until his death in August of 1924. 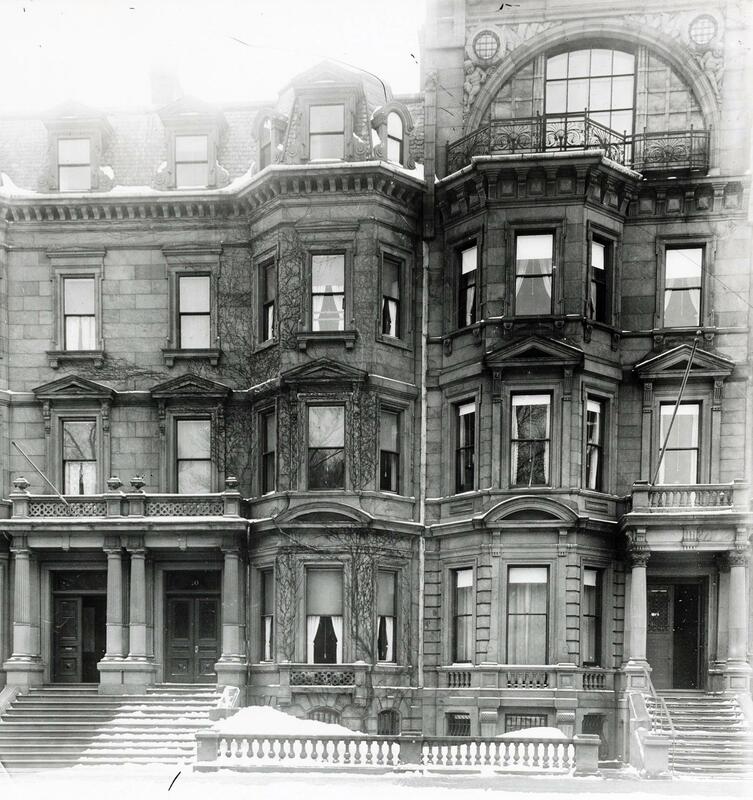 Alice Allen and her step-daughter, Eleanor W. Allen, continued to live at 12 Commonwealth during the 1924-1925 winter season, but moved thereafter to an apartment at 65 Commonwealth, which had recently been completed. On January 21, 1925, 12 Commonwealth was purchased from Alice Allen and Thomas Allen’s estate by Jacob Marks. He subsequently purchased 14 Commonwealth, razed both houses, and built The Barclay on the site. 14 Commonwealth was designed and built in 1871-1872 by architect and builder Charles K. Kirby, for speculative sale. Charles Kirby purchased the land for 14 Commonwealth on September 30, 1871, from Frederick S. Nichols. Frederick Nichols had purchased the property on December 11, 1865, from real estate dealers Henry Whitwell and Samuel Horatio Whitwell, part of a larger parcel Henry Whitwell had purchased from the Commonwealth of Massachusetts on May 2, 1860. Click here for an index to the deeds for 14 Commonwealth (Demolished). After completing the house, Charles Kirby sold it on April 21, 1873, to Patrick Grant and Caleb William Loring, trustees under the will of William H. Bordman for the benefit of his sister, Charlotte (Bordman) Rice, the widow of Henry Gardner Rice. 14 Commonwealth became the home of Patrick Grant, a commission merchant, and his wife, Charlotte (Rice) Grant, the daughter of Henry and Charlotte (Bordman) Rice. They previously had lived at 5 Chestnut. They also maintained a home in Nahant. Charlotte Grant died in February of 1882. Patrick Grant continued to live at 14 Commonwealth in 1883. His business failed in that year and he sold the house and, in the Fall of 1883, moved to live at 104 Marlborough with his son and daughter-in-law, Robert and Amy (Galt) Grant, who had been married in July of 1883. On September 20, 1883, 14 Commonwealth was purchased from the William H. Bordman and Charlotte (Bordman) Grant estates by Anna (Nichols) Wright, widow of dry goods merchant John Harvey Wright. She previously had lived in Brighton. Her brother, Lyman Nichols, lived with her and also maintained a home in Nahant. He was president of Continental Mills. Lyman Nichols died in January of 1907. 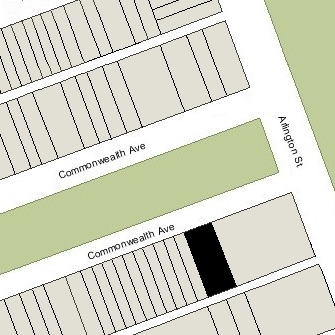 Anna Wright continued to live at 14 Commonwealth until her death in July of 1910. On June 29, 1912, real estate dealer James Sumner Draper purchased 14 Commonwealth from Anna Wright’s estate. On August 8, 1912, 14 Commonwealth was purchased from J. Sumner Draper by importer and wholesale grocer Alonzo Wilder Pollard. He and his wife, Elise (Welch) Pollard, made it their home. They previously had lived at 1396 Beacon. A. Wilder Pollard died in February of 1917. Elise Pollard continued to live at 14 Commonwealth with their unmarried children: Frederick Wilder Pollard, Katharine Pollard, and Priscilla Pollard. She also maintained a home, Barlovento, in Gloucester. Katharine Pollard married in the early 1920s to Rev. William Francis Adair Stride, an Episcopal minister whom she met in Newfoundland while she was serving with the Grenfell Mission. After their marriage, they lived in Hamilton where he became rector of Christ Church. Frederick Wilder Pollard, a lawyer, died in February of 1925. Priscilla Pollard married in October of 1925 to Joseph W. Woods. After their marriage, they lived at 52 West Cedar. Elise Pollard moved soon thereafter to 101 Chestnut. On December 1, 1925, 14 Commonwealth was purchased from A. Wilder Pollard’s estate by Jacob Marks. He had acquired 12 Commonwealth earlier that year. He subsequently razed both houses and built The Barclay on the site.